Needing to find a data recovery company in California? It may be harder than you think. A bad situation could be made worse by having your local computer repair shop or one of the big box service centers work on your damaged hard drive or RAID array. Read more about our data recovery services here. At ACS Data Recovery we’ve worked with clients in just about every major city in the California of California. Even though our main lab is located in Central Texas, we are less than one day away via Fed-Ex or UPS. Our company regularly receives storage devices needing data recovery from clients living all over California, including Los Angeles, San Francisco, San Diego, Anaheim, Santa Barbara, Oakland, Sacramento and others. Wanting to have someone within California perform your recovery is completely reasonable, but may not always be the best course of action. Data recovery can be fairly expensive, and finding a cheap local solution is almost impossible. This is when placing a value on the lost data becomes important. Ask yourself this question…”Can I afford to lose this data forever?” If you are talking about decades of family pictures or data that is critical to your business, then the answer is most likely…no. It’s almost always advisable to avoid any computer repair shops or big box stores that say they can recover data from damaged or clicking hard drives. That would be similar to going to a massage therapist when you need hip replacement surgery. Hard drives are one of the most complex devices we use in everyday life and the work and hardware required to recover data from them is very specialized. An additional point to keep in mind is, data recovery is not cheap. So if a company says they can perform data recovery on a clicking hard drive for just a couple hundred dollars…avoid them completely. You will have nothing but heartache if the data has any value at all. Most recoveries on going to cost anywhere from $500 to well over $1,000 on most storage devices, depending on the severity of the problem. That means when you are searching for data recovery companies in California, you need to research the companies you are considering. Do they even have the ability to sucessfully recover data from a failed hard drive? Do they even have a Class-100 or better clean room onsite? Our warnings here are not meant to simply scare you into using our company. 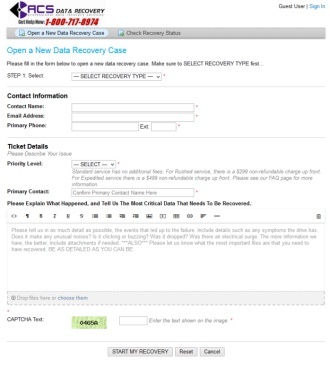 We just want to make sure you use a reputable data recovery company in California or anywhere else for that matter We even give you information here on our own website for other reputable companies that you can choose from. At ACS, we strive to make the entire data recovery process as easy and as transparent as possible from start to finish. We are one of the only companies that has actually demonstrated our abilities by documenting start-to-finish, actual data recovery jobs we’ve worked on. 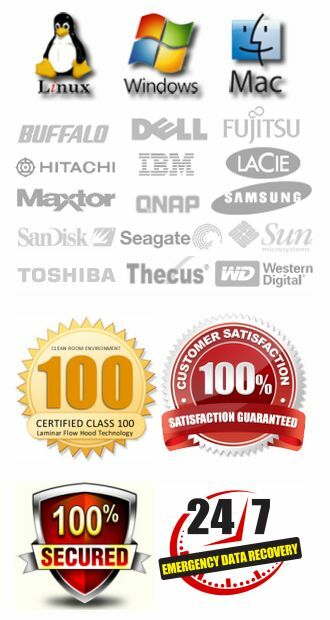 Since 2003 we have been providing data recovery services to customers in California and throughout the world We want you to feel confident and comfortable with using our services. We guarantee your data security and if your data is unrecoverable there is no charge. If you are part of a computer service center or networking firm located in California, ACS Data Recovery would be interested in signing you up in our partner program. For more information visit our reselller page.